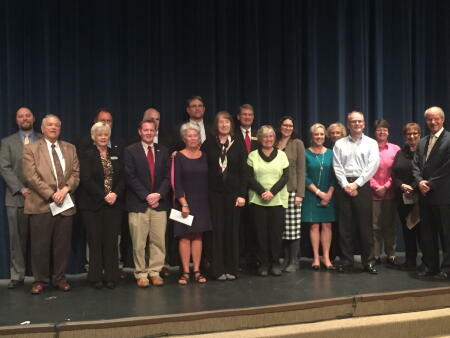 Rockingham County Community Foundation board members joined Dan River Basin Grant Program grant recipients and Duke Energy representative Janet Silvers for a photo after grant awards and a reception at Rockingham Community College. RCC President Dr. Mark Kinlaw (not pictured) welcomed the group. The board awarded more than $144,000 of the $250,000 grant from Duke Energy. A second round of grants will be held in early 2017. Board members pictured are: Robbie Citty, Mike Fargis, Janice Tate, Dixie Penn, Flavel Collins, Micky Silvers and Board President Ben Tucker.